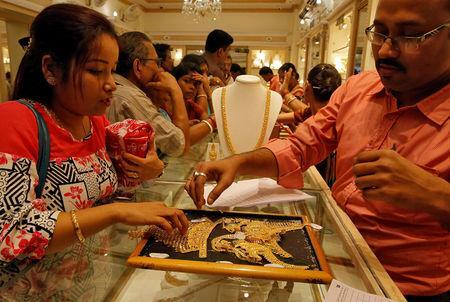 MUMBAI/BENGALURU (Reuters) - Demand for physical gold in India rose this week as jewellers stocked up for a major exhibition, allowing dealers to cut discounts to the lowest in two months, while the Lunar New Year holiday kept activity subdued in other major Asian hubs. Dealers in India, the world's second biggest gold consumer after China, were offering discounts of up to $1.5 an ounce over official domestic prices, the lowest since the second week of December, as against $4 discounts last week. Demand improved as jewellers made purchases for next week's exhibition, said Mukesh Kothari, director at bullion dealer RiddiSiddhi Bullions in Mumbai, referring to the India International Jewellery Show that kicks off in India's financial capital on Sunday.